If you're doubting all the hoopla that the housing market is back, here's some evidence you can see with your own eyes. In a video of a recent open house in the San Diego neighborhood of Rancho Penasquitos posted to the blog Calculated Risk, a "frenzy" of homebuyers descend on a newly listed home in droves. 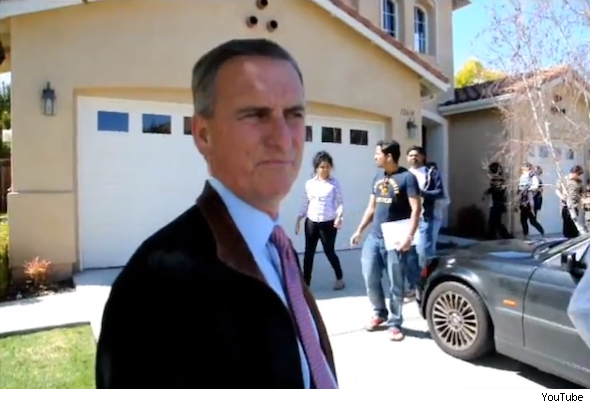 "Jim the Realtor," as the host of the video (pictured above) is known, says that the owner of the home, priced at $699,000, got 50 phone calls about the listing before the open house. In the second quarter of 2012, 57 percent of homes sold in California had multiple offers, the highest in more than a decade, according to the California Association of Realtors. And in February, the Los Angeles Times reported that California's home prices spiked a massive 23.5 percent in January compared to a year prior, a surefire sign that homebuyers are hitting the pavement once again in search for a house. You'll see in the video below that a very steady stream of people comes in and out of the house, and an impressive collection of shoes built up outside the front door where a high volume of polite visitors apparently had left them before entering. It's all evidence that people -- well, at least in this area -- are back house hunting like crazy. Jim goes on to say in the video that the owner of this particular home got an offer sight unseen and expects to field at least 10 offers total on the place. "Jim" claims that one of his own listings (not the home in the video) got 25 offers!